Is solar thermal heating out of date ? Re: Is solar thermal heating out of date ? It looks like the efficiency of thermal heating in that hybrid panel drops off as fast as a normal thermal heating panel that is 'unglazed'. Since PV efficiency also drops off with higher temperatures, it looks like this hybrid panel is kind of combining the worst of both systems. It appears that you can get much better performance by creating two separate systems. One (hot one) for thermal heating and one (cool one) for PV. Thanks for the graph. It's very interesting. This is a product for the European market, our roofs are much smaller than in the US. The applications I know about are on residential buildings, which means a lot of people for a small roof surface, which is why there is that heat pump application. The problem with heat pump is to have the smallest temperature difference between cold and warm side, so with 20°C cold water, you can get a better efficiency than with standard system when producing hot water. If you want 20°C water, you don't really need to insulate your panel. In Europe, there are also subsidies for using new concepts. This is a typical project that could apply. Another application for these panels is in combination with the Ice Storage from Viessmann. If you can't do geothermy, you can use a big tank of water (serveral cubic meters, I saw a projet with 700 cubic meters) and take the heat out of it. As long as the whole tank is not frozen, ice temperature stays at freezing point, so you can get water at 0°C for your heat pump, which is much better than low depth (5 to 10 meters) geothermy. To reduce the size of the ice storage, the tank can be heated using solar panels, so even in the winter, you can get some extra heat. Solar panels can also provide heat directly to the heat pump. The tank is not insulated so that you get some extra heat from the ground. - heat coming in the ice storage + cooling going out = heat going to the heat pum. - heat going to the heat pump < heat going out, and this is because of the electrical consumption that is transformed into heat. During the summer, the ice can be used to cool the building. The difficult thing is to have enough ice for cooling in September, and no more ice in october when heating season starts. This system is quite expensive. The PV+ice storage thing is neat. I see multiple AC applications for that. Thanx. Been away for the weekend but that's my old dream that will never be. It doesn't have to be expensive if you are willing to do some heavy work yourself and has some knowledge about heat pumps. Thermal storage tanks are nothing new. I have a slighty larger, and rather old, dream that I've never realized. Heating during winter is the main problem in Scandinavia, even if winters are becoming warmer and warmer. So; bury a large sturdy tank that withstands freezing, feed it with solar hot water panels, then use a heat pump to warm the house. By doing so, I can use the panels more efficently at really low temperatures and also be able to utilize the phase changing properties of water. A heat pump filled with propane or propylene will be efficient in harnessing heat from zero degrees. But with the winters lately I will do just fine with the three homebuilt and interconnected air to air/water systems I use now. The oldest of them is thirteen years old and it runs every day, all year around. Pretty much my own conclusion as well, Rob. There are certainly uses for this but not for everyone and it's a lot better than solar roadways. One idea I've had is a glass box big enough for your house and an air cycle heat pump moving the heat from the glass box back into the house. Consider the outdoor unit's air flow rate, my smallest and oldest (14yrs old now) can consume 2150 m³/h which equals 51.600 m³ of air per day. Also consider that water (vapo(u)r) carries the energy. Your box will quickly become very dry, cold and inefficient for a heat exchanger, in heat mode the outdoor unit is the evaporator, so you would need to figure out how to re-humidify the air as well. A super sized glass box, would be frozen solid at my latitude during winter and colder/drier than the ambient air and therefore rendered useless. I also had clouds of course, and forecasts with even more cloudy days... That seems to be a standard feature of any solar and wind installation. There were some openings in the cloud cover, so I managed to get a couple of short videos. One from the main screen and one from the Harvi CT screen. The speed of the Eddi was one of the most important considerations I had beforehand. Not much energy sent to the grid and it adjusts really fast to shifting loads. Nice! Now I'll be waiting for a clear sunny day, then I'll decide what to do with my hot water panels. Repair or remove. Edit; removed the second video. Looks a little bit like the SMA interface. The reason for updating now is that they (after close to five months of silence and ignoring emails about the timeframe) promises to roll out the firmware update. I'm looking forward to it. But the dark months are here now so I won't have any use of it, until spring. Patience is a man's best friend, the update (including the required hub) should be on it's way now. Yawn. Lifting this thread since it's close to my own issue now. I've retired my solar hot water panels after the latest recent failure and temporarily placed PV-panels on top of them (at a 51° angle which is spot on this time of year). A bit expensive but specs looks good and if someone in here has any real world experience of it, I'm all ears. What a lucky coincidence, today on November 19, I recieved the hub and should be able to update my Eddie so that it should be able to work properly on a three-phase grid. Adding the updated manual for the Eddie and also the update pdf's sent out for both the Eddie (available FW version 2.027) and the Zappi (available FW version 2.000). The unfortunate part is that I've got at least two dark months ahead. Last summer I contacted Myenergi to ask them about 3 phases car loader and they told me that it would come sometimes around the end of the year. It sounds normal that the 3 phases Eddi would be available at a similar time. The problem is that they promised that in the manual. Along with other features not working, see up thread. Manual in #14 and also see my post #59. Edit; What do you mean by "last summer" etienne? I was in contact with their tech guys in early May about these issues (and bugs) in the firmware. In July or August this year because we work on a residential project with a parking lot for 12 cars, and the builder promised EV loader to the customers. The normal Zappi is very interesting in that context because it allows a very low intensity loading (6A on 1 phase, which means 24 cars if you have 50 A on 3 phases), but the problem is that it doesn't allow yet fast charging (here 32A on 3 phases) when only one car requires loading. Such a fast loading is not really needed, but it's difficult to explain that you decided not to offer that possibility. Standard 3 phases systems can only load on 3 phases, and 6 A seems to be the minimum required current, so this only allows the loading of 8 cars if you have 3 phases 50A. Residential is complicated because people have private parking places, so everybody needs his own loader. Anyway, you can't ask people to stand up in the middle of the night to change loading configuration in the parking lot. I'm talking about real world issues and bugs in the firmware for the Eddi that I own, not Zappi, but both use Harvi to monitor three phases. Only Harvi has three CT inputs for three-phase supplies. Eddi/Zappi only has two CT- inputs internally. I didn't know Eddi was a one phase heater. At work we use MYPV (http://www.my-pv.com/en/). It's a German product and Germany work with 3 phases just like Luxembourg, it makes things easier. In Luxembourg, injection price is still higher than electricity costs, so I think that it doesn't make so much sense, I always compare it to a Ferrari, it's cool but it's much cheaper to drive a Twingo, and the final result is the same. My boss likes projects with minimal "imported electricity", I prefer the concept of minimal electricity consumption. He will overheat and store the heat, I would use the heat pump to minimize consumption and sale excessive production. If you look at the efficiency of a heat pump, price difference has to be very important to have direct electrical heating from PV cheaper that heat pump heating. I still hope that excessive PV power would make projects like hydrogen production from renewable energy possible. I received an interesting link for small home PV configuration yesterday. Still expensive, but ok for a "just for fun" concept. My parents (living in Switzerland) just saw their electricity contract changed. They use to sale the PV production and buy the electricity they consume. Starting January 1st 2019, they'll do self-consumption using the network as a virtual battery. Since they produce more than what they consume, extra production will be bought by the utility company at 0.07 CHF (CHF is almost like US$) per kWh. If they would consume more than the production, extra consumption would be priced like for any other customer. The only "problem" is that they pay an extra 300 CHF for using the network as virtual battery. 300 CHF per month?? Or per year? Or what? At some point it's better to buy a home battery. The virtual battery has an unlimited capacity without losses, so you can do long time storage. The battery can even deliver more than what has been injected (of course you have to pay for that energy). On the systems I know, losses are very high on batteries during the winter because the inverters are always ready to load into the battery any sun that could come, it would be better to turn them off but this is not a standard option and might create problems with the warranty in case of technical problems. I guess that the 300 CHF are more or less what my parents used to pay for the grid costs. I don't know if the 300 CHF are related to the kWp of the PV panels. I guess so, otherwise it would be really expensive for small systems. Mornin' & Happy New Earth Cycle! No use for my Eddi (or batteries), this time of year. Adding the graph from yesterday. Brighter days are coming. Thanks for the response Etienne. 25 CHF per month is a bit expensive but does make sense. I have more details now. My parents have to pay per year 45 CHF per 1 kWp installed. Offer is only valid for systems up to 10 kWp. Battery available is 700 kWh per 1 kWp. It is not clear if it works like a battery (can be uploaded as often as needed as long as you don't go over the maximum) or if the battery can only be loaded once a year (if they just do at the end of the year the difference between injected current and imported current, with the free limit being 700kWh per 1 kWp installed). I guess it is the second solution because the first one would be too complex to manage. They produce 7000 kWh with 6 kWp. It is because they are quite high (1400 m altitude) in a sunny area, so they have much less clouds than here in Luxembourg (we calculate with maximum 1000 kWh per 1 kWp, depends of the orientation). They are not allowed to install another battery. The utility company gets the "garantie d'origine" of the produced kWh. Garantie d'origine is a tradable certificate that certifies how much PV power has been produced. It means that even if my parents use their own PV electricity, they might be classified as using nuclear power and the utility company can sale nuclear power to somebody else saying that they have bought PV power. I don't know if it is a good deal, but it looks like they didn't really have any other choice. 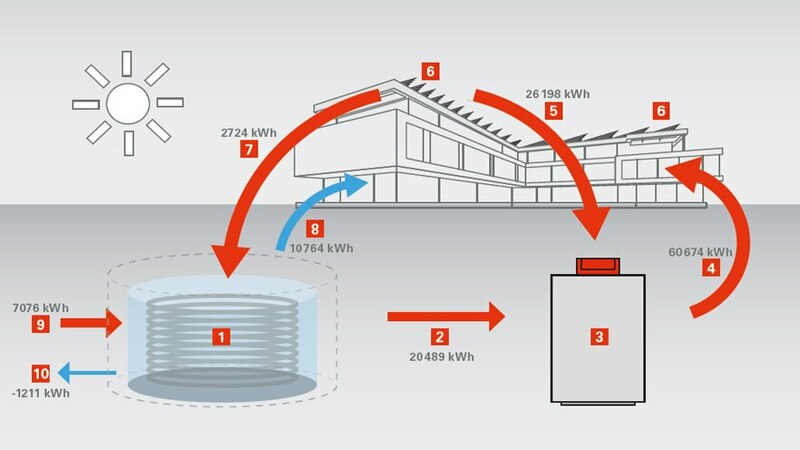 the alternative in general is not to connect to the grid, adapt the amount of battery storage to capacity and needs, feed the house with a secondary grid (1-3 sockets per floor) and adapt the number of connected consumers to availability. - basic feed for heating, air-conditioning, warm water storage etc. - in calculate day versus night hours and the related usage and buffer with batteries. technology was extremely expensive and not so readily available like now. - in case of excess power add more users like kitchen and television etc. in case of shortage disconnect users like heating, air-conditioning etc. advantage is that there almost no restrictions since all is private. beside that it costs a a fraction because the interfaces between public grid and pv and the related obligations is what really boosts the price of the entire installation. i purchase a marine wind turbine, very small and non-obtrusive as well as low-noise level to keep the battery charged during extended rainy and/or foggy/cloudy periods. I can't see how this could go out-of-date on locations with cold nights and warmish days. This alone cannot though solve heating issues far north, i think as there just isn't enough sun during the winter months. Fe. our yard gets (if there's no clouds) about 2 hours of sun for the location during November 15th - February 15th so no amount of panels could provide enogh heat for the house for the colder nights. Well, maybe, but that would mean rebuilding the whole house from ground up. Here is an energy consumption graph of a residential building with PV, batteries and heat pump. Red means from the grid, blue from the batteries, green is direct PV. Globally, the building produces more electricity than it consumes, but self consumption only covers 50% of the needs (about 2/3 direct PV and 1/3 with the 15 kWh batteries). As you can see, there is no way to go through the winter without grid. My parents' situation is similar, excepted that they have solar thermal instead of heat pump, and during the winter, extra heat is directly produced with a standard electrical heater, but the house is build with the idea of getting as much heat from the sun as possible, also through the windows. This is only possible because they are high enough in the mountains, so that the house doesn't overheat in the summer.